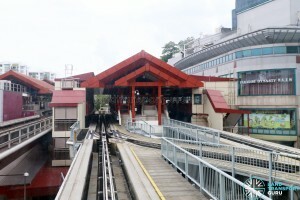 Choa Chu Kang MRT/LRT Station (NS4/BP1) is an interchange station along the North South Line (NSL), as well as the terminus of the Bukit Panjang LRT (BPLRT). 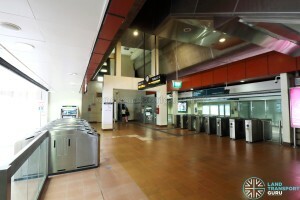 Located within the Choa Chu Kang Central planning subzone, the station is overground station and located just off Choa Chu Kang Avenue 4. Choa Chu Kang originally referred to the former Chua Chu Kang Village near the National Shooting Centre today. The name was used main arterial road heading eastbound towards Upper Bukit Timah Road, and later began to be applied to developments surrounding this arterial road where Choa Chu Kang New Town stands today. 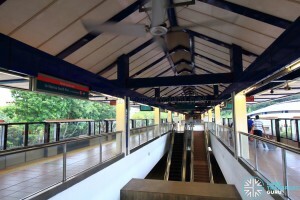 Choa Chu Kang Station serves the town centre area, including the Lot 1 Shoppers’ Mall, nearby community amenities, and large numbers of residential developments. 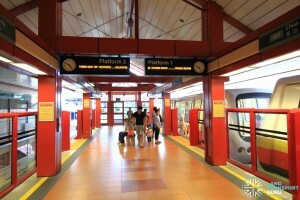 Bus services are offered from the Choa Chu Kang Bus Interchange connecting to other parts of the estate. 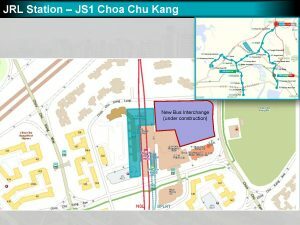 By Year 2026, Choa Chu Kang station will be an interchange station with the Jurong Region Line Phase 1, with the station code NS4JS1BP1. Operating hours for Bukit Panjang LRT from 13 January 2019 are revised to close earlier daily to facilitate maintenance works. 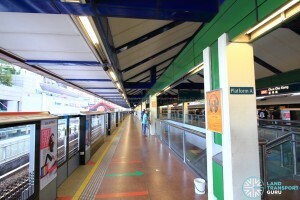 Choa Chu Kang’s elevated North South Line platform level has two platforms in an island platform arrangement. 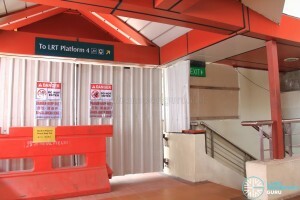 Half-height Platform screen doors are installed at the platform edge for commuters’ safety, and High Volume, Low Speed (HVLS) fans keep passengers cool. 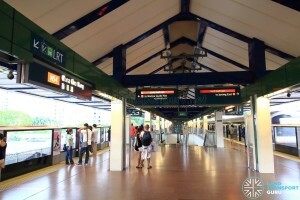 The Bukit Panjang LRT station is overground with one island platform for passenger boarding, and two side platforms for passenger alighting. 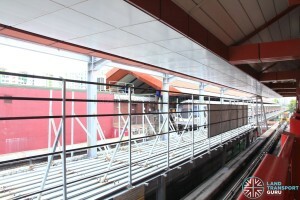 Fixed, half-height barriers along the platform edge are installed for passenger safety, especially during peak hours when the small platform gets crowded. Fixed platform barriers (without platform doors) are installed at the platform edge for commuters’ safety, and ceiling fans at the platform keep passengers cool. 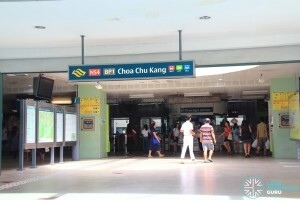 Services A and B operate out of Choa Chu Kang station and are staggered one after the other. 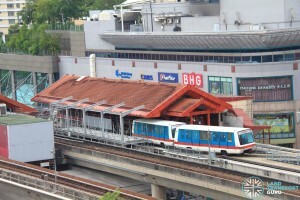 Both services run till Bukit Panjang, thereafter Service A plies the clockwise route (via BP13 Senja), while Service B plies the counter-clockwise route (via BP7 Petir), before returning to Bukit Panjang and back to Choa Chu Kang. 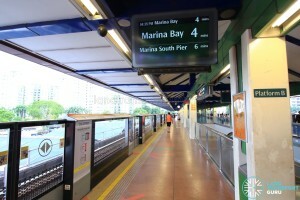 Passenger Information Systems, which are LED displays located at each platform, display expected train arrival times and scrolls through messages, while an analog clock gives the time. Tactile flooring helps to guide the visually-handicapped from the platform to the station exits. Staircases and lifts connect both platforms to the mezzanine transfer area and station concourse. 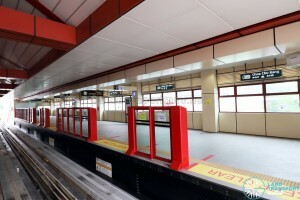 Two new side platforms were constructed at Choa Chu Kang LRT station. 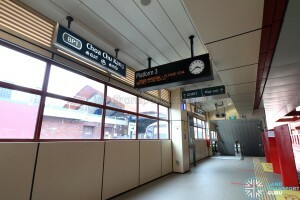 The new Platforms 3 and 4 are used for alighting only, thereby freeing up the existing island platform (Platforms 1 and 2) solely for boarding activities. The segregation of boarding and alighting passengers speeds up the movement of commuters, which is very useful for a interchange station like Choa Chu Kang with heavy passenger movement. This arrangement is also known as the Spanish Solution. 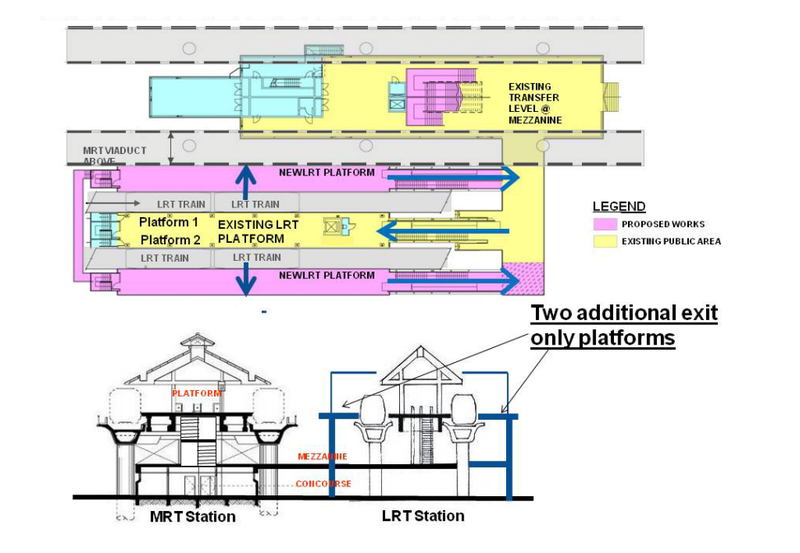 The new platforms are not equipped with lifts, hence passengers in need of lifts have to alight at Platforms 1 and 2 for lift access. These new platforms were opened on 27th December 2016. 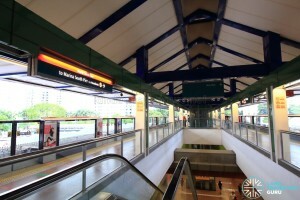 Both the North South Line and Bukit Panjang LRT stations have a common concourse at ground level. 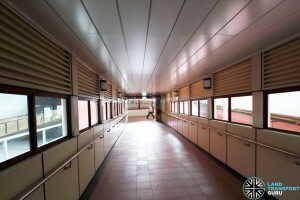 The main ticket concourse is located underneath the North-South Line platforms, with stairs leading to a mezzanine level for passengers transferring between both lines. In addition, a new Exit E provides an alternative exit from mezzanine level, at the side of the BPLRT station. 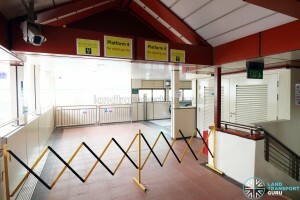 The concourse feature faregates for automatic fare collection and provides access between paid and unpaid areas of the station, with at least one bidirectional wide-swinging gate for the benefit of passengers-in-wheelchairs and those carrying bulky items or travelling with prams. 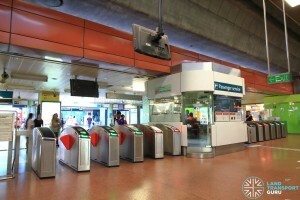 General Ticketing Machines allow commuters to purchase tickets for single or multiple journeys, and along with a Transitlink Add-Value Machine, offer contactless card transactions. 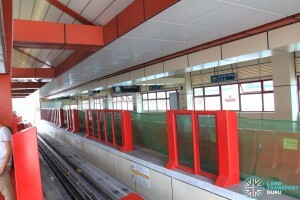 As with other BPLRT stations, Exit E only has one ticketing machine serving both paid and unpaid areas, with a swing gate that allows either side to access the machine at any one time. 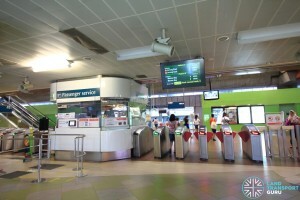 At the NSL concourse, the station office functions as a Passenger Service Centre, where commuters may make travel inquiries or perform card transactions using cash payment. 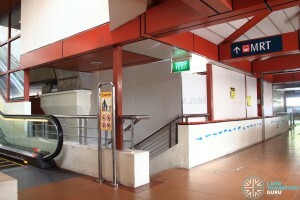 Retail shops and public toilets are located in the unpaid area of the NSL concourse. 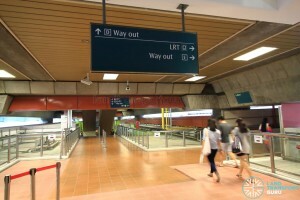 Choa Chu Kang MRT/LRT station has five exits at ground level (A, B, C, D and E). 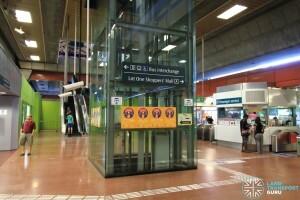 All exits offer barrier-free accessibility with the exception of Exit E.
Emergency Train Stop buttons on both NSL/BPLRT station platforms, when activated, will prevent approaching trains from entering the station, and any train already stopped at the platform will be prevented from moving off. 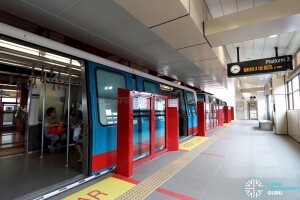 Emergency telephones on both NSL/BPLRT station platforms and the intercom system inside the lifts enable commuters to communicate with station staff in the Passenger Service Centre. Emergency door handles allow the NSL platform doors to be opened manually from the train-side in the event of failure. 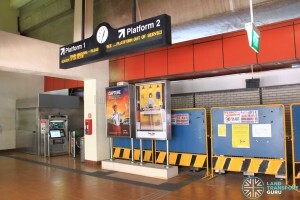 Choa Chu Kang station connects to a bus interchange, several bus stops in the vicinity, as well as taxi stands and passenger pick-up points at selected exits. 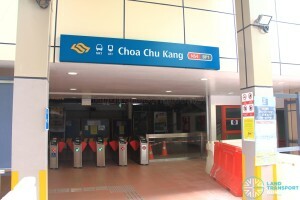 The station is linked to Choa Chu Kang Bus Interchange and two other bus stops in the vicinity . 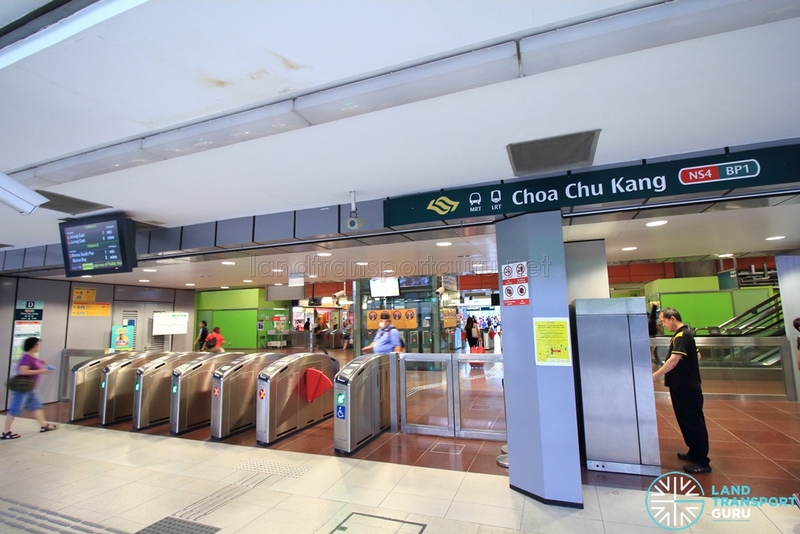 In addition, passengers can board regular bus services at Choa Chu Kang Bus Interchange and bus stops officially linked to Choa Chu Kang station for free rides. 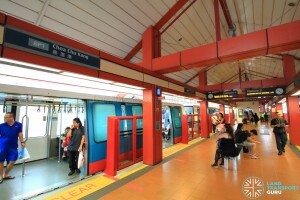 As an interchange station in the heart of the Choa Chu Kang town centre, Choa Chu Kang MRT/LRT station is well-utilized by commuters living in the estate, or heading to various amenities in the vicinity such as Lot One Shoppers’ Mall, Choa Chu Kang Centre, Choa Chu Kang Public Library and Community Club @ Keat Hong. 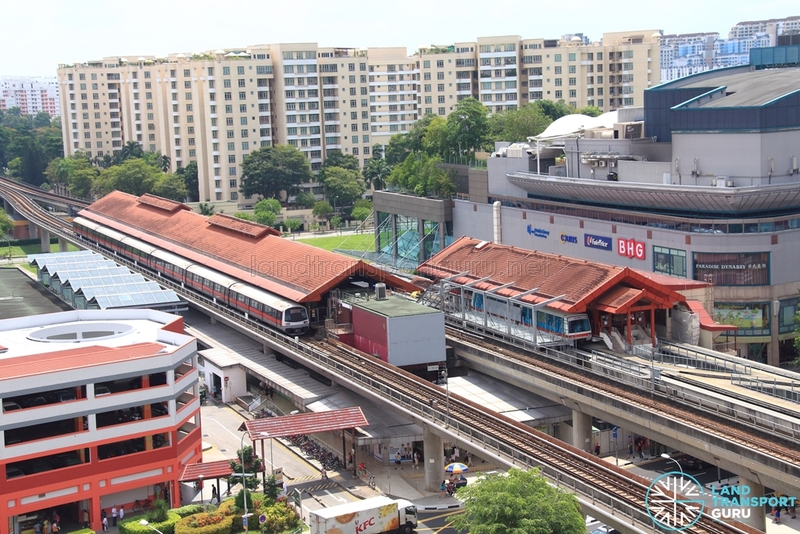 This station also serves plenty of transfer commuters between both rail lines, as the North South Line connects to other parts of the island, while the Bukit Panjang LRT provides the final connection to within walking distance of most of the estate’s residential apartments. 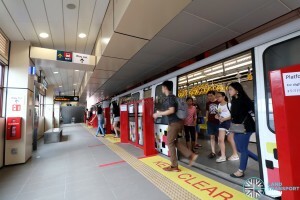 Two additional side platforms for the Choa Chu Kang LRT were opened on 27 December 2016. 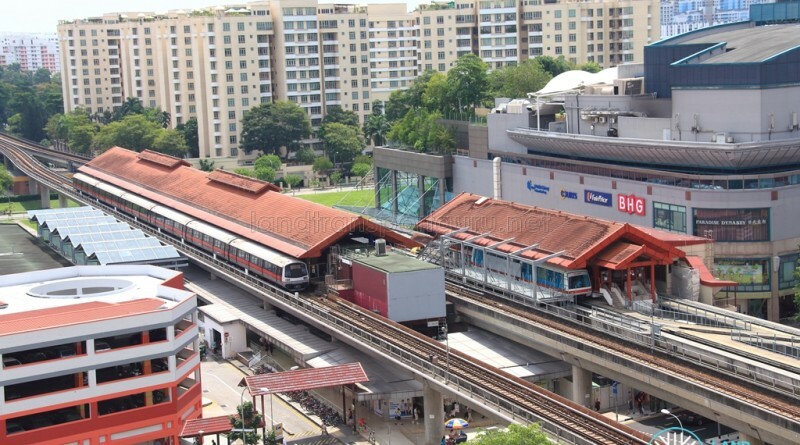 By Year 2026, Choa Chu Kang station will be an interchange station with the Jurong Region Line Stage 1.